The so called ‘Cold War’ seems to have ended between the ‘Khan Trio’, a picture of their friendship has cropped up yet again at the release of the first look of Salman Khan’s upcoming film BAJRANGI BHAIJAAN. Instead of the customary release of the first look by the hero of the film, the first look of Salman Khan’s much awaited movie BAJRANGI BHAIJAAN has been unveiled by none other but his arch rival turned friend Shah Rukh Khan. It may be remembered that Shah Rukh Khan and Salman Khan shared a health relation in the past and have worked together in many films like KARAN ARJUN, HUM TUMHARE HAIN SANAM and KUCH KUCH HOTA HAI. But the two came at loggerhead after they clashed at Katrina Kaif’s birthday party in 2008. Later after five years of enmity in 2013 famous politician Baba Siddiqui brought the duo together at an Iftaar party. Since then Shah Rukh Khan has developed a soft corner for Salman Khan. Be it during the wedding of Salman Khan’s sister Arpita, where SRK played a perfect role of an elder brother by blessing her and also dancing with Salman at the Mehndi function that took place at Salman Khan’s residence. He was also seen at Rajat Sharma’s ‘Aap Ki Adalat’ 21 years celebration party along with Aamir Khan. Again on May 5, ahead of the court verdict on Salman Khan’s hit-and-run case, Shah Rukh Khan was seen visiting Salman’s residence at the Galaxy Apartments. 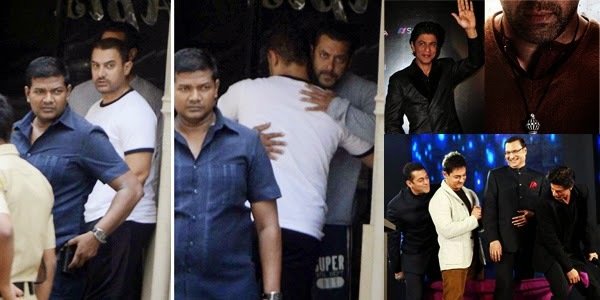 So shall we presume the SRK-Salman enmity is over and a new chapter of friendship developed?